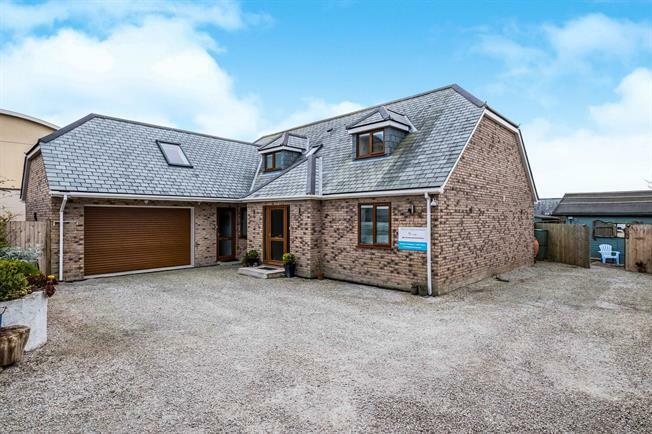 5 Bedroom Detached House For Sale in Newquay for Guide Price £675,000. This modern contemporary property is situated in a quiet tucked away position yet a short walk from Cornwall's leading Fistral Beach. This well designed and substantial property is very flexible in its accommodation layout and could be used as one single large property or equally with a separate annexe which would be ideal for dependent relatives with their own access. The wide entrance hall has a wonderful first impression of the space that is to follow with the double height ceiling and bi-fold door leading to the main reception room. Off the hall is the front room that was originally designed as a bedroom however is equally usable as a further reception room or certainly as a work from home office with clients easily and discreetly using this without impinging on the privacy of the rest of the house. Off the hall is a shower room which is perfect for those days coming back from the beach. The breadth of the house is the length of the kitchen/dining/sitting room with the vendors having a clever design of separating the sitting room area with bookshelves which nicely delineates the area for people to relax watching TV and those in the entertaining area of the kitchen/dining area. This design maintains the light and spacious nature of the room yet provides that distinction of space making this perfect for multiple uses at the same time without interference. The kitchen is sleek in its design with numerous wall and floor mounted units and central island unit with breakfast bar, gas hob with the dining table adjacent. Two sets of bi-fold doors are off this expansive room and really bring the outside in and is a true delight in summer making use of the south facing rear garden. Additionally to the ground floor is the utility room, a further bedroom or office/study and bathroom. This space could easily be converted to a separate annexe for dependant relatives or could be let as it has its own entrance. Completing the ground floor is the integral double garage with electric door. Oak stairs rise to the first floor where there are four double bedrooms with three having en-suite facilities and far reaching rural views. The master bedroom is of particular note measuring in excess of 18 feet in length. Completing this floor is the family bathroom which has a separate shower cubicle. Externally there is driveway parking for multiple vehicles to go alongside the double garage and the south facing enclosed rear garden that is a real sun trap and is approx. 25m in width. The current owners have an enormously useful guest chalet in the corner of the main house garden with its own private courtyard garden. The chalet is perfect for a couples get away, holiday let or equally as overflow accommodation for guests. Newquay has long been regarded as the United Kingdoms most popular coastal resorts and is internationally recognised as the United Kingdom's finest surfing destination. Newquay enjoys some of the finest beaches in the country with many miles of picturesque coastline, which enjoys the protection of the National Trust. Newquay Airport is just a short distance from the town and provides regular flights to London and an ever increasing selection of European destinations. Approximately 13.5 miles away is Cornwall's only City, Truro. With comprehensive commercial and banking facilities and excellent shopping which caters for all needs one would expect from the county's main town. Truro also offers a wide range of either private or state schooling along with a main line railway link to London Paddington. Both the sailing waters of the Carrick Roads on the south coast and the surfing beaches on the north coast are within ten miles drive and there are also a number of golf courses within a ten mile radius. The following services are available Mains electricity Mains water supply, mains drainage, gas central heating and telephone connection although we have not verified this. Owned solar panels provide good return with feed in tariff.